Noura Mint Seymali is a nationally beloved star and one of Mauritania’s foremost musical emissaries. Born into a prominent line of Moorish griot (West African praise singers, poets and musicians) Noura began her career at age 13 as a supporting vocalist with her step-mother, the legendary Dimi Mint Abba. From a very early age, she was trained in instrumental and vocal technique by her grandmother, Mounina, mastering the ardine, a harp reserved only for women, and singing at weddings with family. 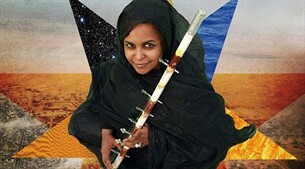 Noura Mint Seymali is a nationally beloved star and one of Mauritania’s foremost musical emissaries. Born into a prominent line of Moorish griot (West African praise singers, poets and musicians) Noura began her career at age 13 as a supporting vocalist with her step-mother, the legendary Dimi Mint Abba. From a very early age, she was trained in instrumental and vocal technique by her grandmother, Mounina, mastering the ardine, a harp reserved only for women, and singing at weddings with family. Seymali Ould Ahmed Vall, Noura’s father, was similarly an important teacher, himself a seminal figure in Mauritanian music who devised the first system for Moorish melodic notation and composed many works popularized by his wife, Dimi. Seymali sparked Noura’s compositional instincts and encouraged her earliest experimentations with fusion music. Reared in this rich and transitive music culture where sounds from across the Sahara, the Magreb and West Africa coalesce, Noura Mint Seymali currently drives the legacy forward as one of Mauritania’s most adventurous young artists.